Sure, we may have our own flea markets and food-and-craft fairs around the city, but we&apos;ll soon be getting our very own weekly "Smorgasburg," an extremely popular New York City market. 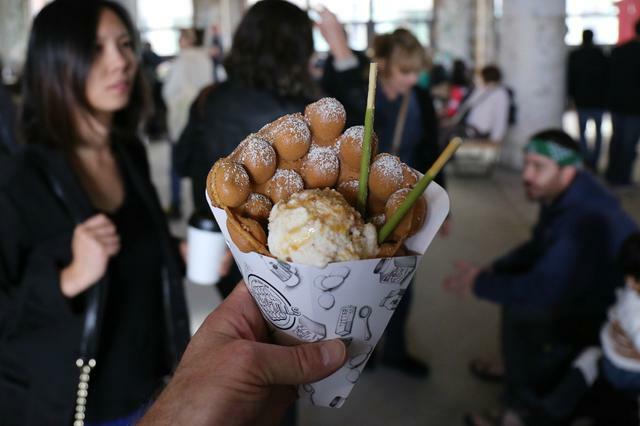 Come June 19, Smorgasburg will be making downtown Los Angeles&apos; Alameda Produce Market their home every Sunday. Expect over 100 vendors on their opening day at the massive over five-acre site, with a "heavy emphasis on food, plus some vintage/antiques, high craft, kids activities and clothing, records, and more," according to a release. At their past NYC markets, they&apos;ve had the likes of popular food vendors like Ramen Burger, Red Hook Lobster and Milk Truck whip up delectable dishes. Seriously, all the food looks drool-worthy. Smorgasburg started in 2011 as a spin-off from Jonathan Butler and Eric Demby&apos;s Brooklyn Flea, another popular market that launched in 2008. 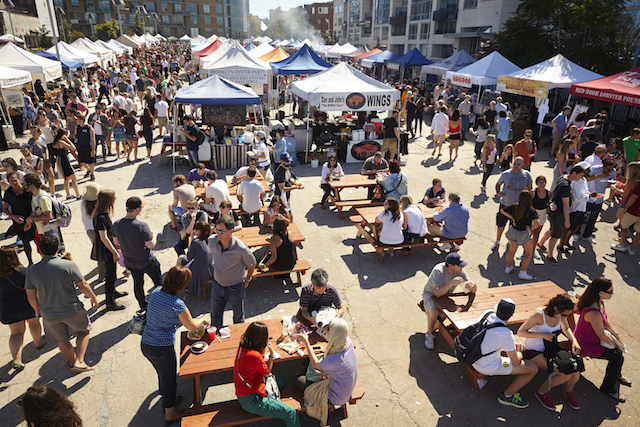 Demby tells LAist that even though the Smorgasburg name is attached to the L.A. rendition of the market, it&apos;ll be a combination of both markets. It just so happens that the Smorgasburg brand kind of eclipsed the Brooklyn Flea name over the last couple of years, so they&apos;re going with that name in L.A. It&apos;ll be a very "food-forward" market but with "sophisticated things to buy and experience," like wellness items, textiles, fragrances, and vintage and antique items, he says. However, it will be different than their other East Coast sites because this downtown L.A. space they&apos;re taking over is four to five times bigger than their other sites. With the extra space, they&apos;ll be able to "spread out" and create places to hang, bring more experiences and "more ways for creative people to do the things they want to do," Demby says. So far, they&apos;re just taking in vendor applications, and some of their New York vendors have expressed interest in following them over to L.A.
Demby has hosted other Smorgasburgs in cities like Philadelphia and Washington, D.C. in 2013 and 2014, but choosing L.A. next was something that has been in the works for awhile. He says they actually had a site in the Arts District that they wanted to do the market in 2012, but plans fell through when they couldn&apos;t get the permitting because of issues with the site. That&apos;s when Alameda Produce Market came into the picture. During the weekdays, Alameda Produce Market is a wholesale market, and it&apos;s just a part of the new 30-acre ROW DTLA mixed-use development from developer Atlas Group. ROW DTLA makes up six historic buildings and will have 15 restaurants, 100 stores, gardens and office space. That&apos;s expected to open in summer 2016. Atlas Group told Demby about their big new project and suggested the Alameda Produce Market as a potential site for a Smorgasburg. The team came out to L.A. and checked out the site and met with as many people to "confirm our gut check that it wasn’t just only the moment was right but the location was right," Demby says. As for the right moment, Demby explains that L.A. reminds him of when they started Brooklyn Flea in 2007, when there were "lots of interesting people doing high-quality work— not just food" and there was "a really strong community that evolved to a world-class level." He says there isn&apos;t really a central location space for everyone to come together in an open, public space. The part that makes Demby so excited about this L.A. is the community aspect, and that&apos;s what he thinks made the Brooklyn Flea so successful.